A MAJOR overhaul of street lamps across the city will save millions of pounds and help show Edinburgh in a better light, it has been claimed. Radical plans have been drawn up to replace dull sodium bulbs with bright LEDs as part of a £30 million project to bring the Capital’s street lights into the 21st century. The energy-efficient bulbs will save nearly 40 per cent on the £2.97m spent each year illuminating the city and are likely to offer even future savings with energy prices expected double in the next decade. It is understood lighting inside tenement stairwells – paid by the public purse and costing £800,000 a year – may be given an upgrade as LED bulbs would be installed across 14,000 tenements. The roll-out comes after a successful trial in Saughton Mains and Gilmerton Dykes, where 271 lights were upgraded. The change received an 80 per cent public approval rating. 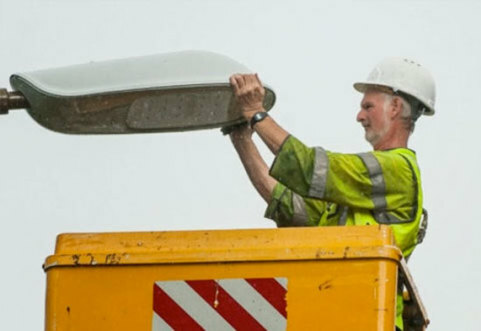 To date, a £2.1m interest-free loan has been secured to transform 6000 street lights, but environment chiefs are targeting a city-wide roll-out ultimately costing around £30m. Sustainability lead councillor Jim Orr said the wholesale revamp of street lighting was part of “Edinburgh’s sustainability journey”. He said: “The LED lights were found to make streets look crisper and better and that’s why they were so well received in the two pilot schemes. “So, by rolling out LED lights we’re making Edinburgh look better as well as saving money and reducing carbon emissions. We were delighted with the results of the pilot, which really highlights the benefits of modern, efficient LED lights. It is claimed LED lightbulbs also enjoy a much longer lifespan than their predecessors, having to be replaced only once every 20 years compared with every two to four years now. A report recommending the roll-out drafted by Mark Turley, director of services for communities, said the lamps use “less energy” and will “therefore secure savings in the lighting energy bill and future carbon tax”. Street lighting will be included in the carbon reduction commitment tax from April 2014, meaning carbon tax must be paid on lighting energy consumption. Current estimates indicate that this would be in the region of £245,600 per year. The transfer from old yellow sodium light to new white light lanterns was also said to have “been proven to enhance community safety”, according to the report. £30m LED lights project to save city millions.